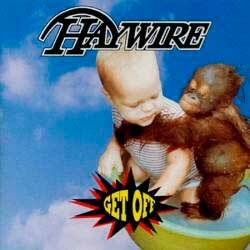 "Get Off" was the fifth and last album from Canadian rock band Haywire. Musically this album is all over the place. The majority of the tracks are melodic hard rock that fall somewhere between Mr. Big and Badlands. Vocalist Paul MacAusland has a soulful voice that has some striking similarities to Ray Gillen. His voice of hard rock tracks like "Down To You", "All Talk No Action" and "Wanna Be the One fit the music like a glove. "Worst Part of Love" is a blues-based hard rocker that reminds me of the band XYZ. The song features a short but smoking' guitar solo and a big hooky chorus. However, this album isn't straight-forward at all. There are a few instrumentals. The album opens with an instrumental that is built around an exotic beat with some nice guitar work. Likewise the album is broken in the middle by a funky instrumental called "The Bunker". "Knuckles" is sort of an instrumental rock and roll shuffle that sounds like a cross between Van Halen and Joe Satriani. The only lyrics on the song are a gang shot of "Get Me Home Baby 902". Then there is a track titled "Get Back" that I can only describe as funk and an R&B love song titled "Buzz". "Wanna Be The One" is a hip-hop based rock song, and the one track I've found myself skipping each time I've spun this disc. "Move Over" is a modern, melodic rock take on Janis Joplin's classic track. The album ends with one of those sappy power ballads that ruled the airways from around 1988 to around 1991 or so. (Think "Fly to the Angels" by Slaughter.) "Get Off" has some excellent songs but it's far from a solid listen from front to back. Diversity on an album can be a good thing but in this case I think it sounds a bit disjointed.